As Pakistan and the world celebrate Universal Children's Day today, it is fair to ask how Pakistan's children are doing? A quick way to capture their plight is to quote a recent AP report in the aftermath of Baluchistan's earthquake. The report said: Children begged for food from trucks passing through Pakistan's quake zone as the death toll rose to 215 and survivors prepared for another frigid night camped out amid wrecked mountain villages. MSNBC recently reported that the worsening economy in Pakistan is especially taking its toll on children, many of whom are being abandoned by their parents. The report highlighted the case of three mothers who could not afford to feed their children. "The three women came together to my center," Bilquis Edhi of Edhi Center said. "They asked me to please take their children; they could no longer feed them." "The mothers were sobbing as they tried to leave the children and the children were crying clinging to their mothers," Edhi said. "It was heart wrenching to watch." While the news of abandoned or begging children offers only a small anecdotal evidence of the sorry state of Pakistani children, the official data paints an equally grim picture. Ranked at 136 on a list of 177 countries, Pakistan's human development ranking remains very low. Particularly alarming is the low primary school enrollment for girls which stands at about 30% in rural areas, where the majority of Pakistanis live. In fact, the South Asia average of primary school enrollment is pulled down by Pakistan, the only country in all of Asia and the Pacific with the lowest primary enrollment rate of 68 per cent in 2005. This is 12 percentage points lower than that of Maldives, which, at 80 per cent, has the second lowest rate in Asia and the Pacific. Low primary enrollment rate and poor health of children in Pakistan raise serious concerns about the future of the nation in terms of the continuing impact of low human development on its economic, social and political well-being. According to Asia Children's Rights report, about 8 million children, or 40 percent of the total population of children under the age of 5, suffer from malnutrition. About 63 percent of children between 6 months and 3 years have stunted growth and 42 percent are anemic or underweight. Poor nutrition leaves these children vulnerable to diseases. Pakistan is among the few countries of the world where Polio is still endemic. Poor conditions extend to the education sector as well. 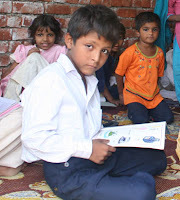 Over 23 million children in Pakistan have never been to school. The International Labor Organization data shows 3.3 million children, between the ages of 5 and 14 years in Pakistan, are forced to work rather than attend school. A quarter of a million of them work as domestic servants. The most recent United Nations Human Development Report indicates that the youth literacy rate in Pakistan is an abysmal 58 percent, among the lowest in the world. Sexual abuse is another problem. Homelessness of children is quite common. Over 10,000 children below the age of 15 live on the streets and sidewalks of Karachi alone. Many of them are forced to beg for survival. Most of these children say they left home because of domestic violence and family financial problems, according to Edhi Foundation which cares for some of them. According to a report by Amnesty International, there are more than 4,500 juvenile prisoners in Pakistani jails and 66 percent of them are being tried. Juvenile detainees are kept with adults, leaving them vulnerable to sexual and physical abuse. The government efforts and UN and international help are necessary but the real success with children will require active participation of private Pakistani citizens of all classes in society. Pakistanis at home and abroad need to come together to light candles rather than curse darkness. Directly or indirectly, all people of conscience should help to alleviate the suffering of the children in Pakistan by volunteering or donating through philanthropic organizations such as Human Development Foundation, Hidaya Foundation, Edhi Foundation, Development in Literacy and other similar humanitarian outfits in Pakistan. New Delhi, July 2 (IANS) India is worse than Bangladesh and Pakistan when it comes to nourishment and is showing little improvement in the area despite big money being spent on it, says Planning Commission member Syeda Hameed. 'There has been an enormous infusion of funds. But the National Family Health Survey gives a different story on malnourishment in the country. We don't know, something is just not clicking,' Hameed said. Speaking at a conference on 'Malnutrition an emergency: what it costs the nation', she said even Prime Minister Manmohan Singh during interactions with the Planning Commission has described malnourishment as the 'blackest mark'. 'I should not compare. But countries like Bangladesh, Pakistan and Sri Lanka are better,' she said. The conference was organised Monday by the Confederation of Indian Industry and the Ministry of Development of Northeastern Region. According to India's National Family Health Survey, almost 46 percent of children under the age of three are undernourished - an improvement of just one percent in the last seven years. This is only a shade better than Sub-Saharan Africa where about 35 percent of children are malnourished. Hameed said the government's Integrated Child Development Services (ICDS) programme, which is a flagship programme to improve the health of women and children, had not shown results despite a lot of money being spent on it in the past few years. 'We have not been successful in improving the status of health of our women and children,' she added. The annual budget for women and child development (WCD) ministry in 2008-9 is Rs.72 billion. Of this, Rs.63 billion is for ICDS. According to Unicef, every year 2.1 million children in India die before celebrating their fifth birthday. While malnutrition is the primary reason behind it, other factors like lack of health facilities, hygiene and good nutrition compound the problem. Narrating her experiences while travelling the length and breadth of the country, Hameed said in many areas women were still starving and finding it difficult to feed their children. She said emphasis should be given on inclusive breast-feeding for six months after a child's birth, maternity benefits for pregnant women and food fortification of ready to eat mid-day meals. 'We are concerned and worried that we are losing human beings in such a manner. It is a disappointment and a blot. We have just improved a fraction and we are determined that we do not let it get worse,' she said. 'It is frustrating to see this dark and dismal picture of undernourishment in the country. We have to learn the experiences from other South Asian countries,' she added. The NFHS survey found that levels of anaemia in children and women had worsened compared to seven years ago -- around 56 percent of women and 79 percent of children below three years are anaemic. Vinita Bali, managing director of Britannia Industries, said the problem was very critical and action was needed from both the government and the industry. She said their 'Tiger' biscuits had been fortified with iron and had shown amazing results. These biscuits have been provided to children in Hyderabad with a midday meal. 'We conducted a study and found that in six months of taking these biscuits, the haemoglobin increased. The biscuits are not only healthy but also fortified,' she said. 'There should be a balance between prevention and treatment. Our focus should be to target the most vulnerable and then only we will have a much healthier future for India,' he added. ISLAMABAD - Abbas Sajeet is 11 years old, but he doesn't go to school. Instead, he earns 2,500 rupees ($30) a month as an auto mechanic in the Pakistani capital, Islamabad. The money goes straight into the meager coffers of his seven-member family. "Every day from the car garage, I see children walking to their schools," he says. "I wish I could go to school with them, finish high school and study engineering. After that, I would have a good job with a lot of money, and give it to my mother." At least 10 million children are believed to be working in Pakistan at a variety of jobs, including some of the hardest and most poorly-paid. Some clean upper-class homes and help baby-sit. Others craft bricks, weave carpets or work in mines. In some cases, families give their children as employees to landlords to pay off debts. That system, known as bonded labor, is likened by human rights activists to slavery. The children who work often lose their chance to attend school and are vulnerable to abusive employers. Still, those are considered acceptable risks for the many poor families who need every member to pitch in for food, shelter and clothing. The South Asian nation has come under international pressure to reduce child labor, but there is little regulation of the practice, despite laws protecting children from exploitation in the workplace. The program has already noted success in a 62% increase in girls' attendance in the last decade. "This is really a big help. In these times when things are so expensive, receiving [cooking] oil free of charge is a real bonus," Fareeda Bibi mentioned while placing the four-litre fortified oil tin by her tiny stove. A tin of oil costs Rs 450 [US$5.5], and Fareeda needs at least three a month to cook for her family of eight. "My husband earns Rs 5,000 [$61] a month as a carpenter, so our budget is tight. Over Rs 1,000 [$12.2] goes towards utility bills; we spend nearly 2,500 [$30.5] on food and then there are new shoes to be bought for the children or medical bills to pay for my parents-in-law. Every little bit that comes in free in such hard times is a bonus." Fareeda's daughter Shama receives the oil at her school in Dera Ghazi Khan District in Pakistan's Punjab Province every month as part of a UN World Food Programme (WFP) operation run in conjunction with the government. "The incentive is mainly to increase enrolment and keep the girls in school. The assistance is only given in girls' primary schools in Punjab. However, in NWFP [North West Frontier Province], Balochistan and Sindh, we have included boys as well," said Amjad Jamal, a WFP spokesman. since 1998, said Marcelo Spinahering of WFP Pakistan. "Children are given high energy biscuits for onsite feeding in certain parts of the country. For the most part they receive take-home rations of four litres of fortified edible oil on a monthly basis and 50kg of wheat on a quarterly basis," he added. Fareeda said the school feeding programme had also played a part in persuading male members of her family to allow Shama to go to school, just like her two brothers. "When they say there is no need to educate girls because they will never need to earn a living, I point out the oil we receive helps us run the house, and then they fall silent," Fareeda said, adding: "Of course it is very important to us that our daughter is being educated. I am not literate and this handicaps me." Noor Bibi, the mother of another young schoolgirl said: "Even though we pay no fees at government schools, my husband says we spend too much on uniforms and books." The oil bonus helps 'balance' this, and she hopes to double the gains in a few years time when her two-year-old daughter is enrolled. Letting “lady health workers” in rural northern Pakistan treat children with severe pneumonia in their homes worked better than the established practice of telling parents to take them to a hospital, a new study has found. The study, published in The Lancet this month, followed 1,857 children who were treated at home with oral amoxicillin for five days and 1,354 children in a control group who were given standard care: one dose of oral cotrimoxazole and instructions to go to the nearest hospital or clinic. The home-treated group had only a 9 percent treatment-failure rate, while the control group children failed to improve 18 percent of the time. Some parents could not afford to take their children to hospitals, which were often understaffed. Researchers from Save the Children, the World Health Organization and Boston University did the study, which was financed by the United States Agency for International Development. Pneumonia is a major killer of infants and toddlers. Pakistan’s network of 90,000 “lady health workers” was founded in 1994 by Benazir Bhutto, then the prime minister. “It’s one of the best community-based health systems in the world,” said Dr. Donald Thea, a Boston University researcher who was one of the authors. A Lancet editorial cautioned that not all local health workers are as well trained and supervised as Pakistan’s and that since northern Pakistan has a low AIDS rate, it would be wrong to assume that every country would do as well with such a system. The first episode of the Pakistan Children Television’s programme “Sim Sim Hamara”, an educational and capacity-building TV series for children, will be aired on Dec 10 at national TV. The TV series will be a high-quality early education resource for a large number of children who lack access to formal education opportunities. “Sim Sim Hamara” is the Pakistani adaptation of the engaging programme “Sesame Street”, created by Rafi Peer Theatre Workshop in collaboration with Sesame Workshop, New York, and funded by the United States Agency for International Development (USAID). The theatre group will create a total of 130 episodes of the “Sim Sim Hamra” broadcast on PTV Home. Throwing light on the background of the project, one of the heads of the PC TV, Faizan Pirzada said Rafi Peer Theatre Workshop, in collaboration with Sesame Workshop, held a national content seminar and four provincial workshops to gather educational advisers from various fields to provide direction for the educational framework for the Pakistan Children’s Television project. He said the participants included representatives from both regional and federal government entities, academicians, performing artists, civil society members working with children, representatives from Sesame Workshop, USAID and the federal education secretary. He said there’s a need to impress upon children and families the fact that learning happens in both formal and non-formal environments. PC television is using authentic examples from the real world, such as observing a family member count change at the grocery store, weighing produce on scales at the vegetable market, reading prayers from the Holy Quran and other holy texts, and measuring ingredients for ‘roti’ as a basis for storylines and materials that promote a lifelong love of learning. The girl’s screams were brittle and desperate. Neighbors in the suburban housing complex looked up and saw a child crying for help from an upstairs balcony. She was 13 and worked as a maid for a couple who had gone on vacation to Thailand. They had left her locked inside their apartment. After a firefighter rescued her, the girl described a life akin to slavery, child welfare officials said. Her uncle had sold her to a job placement agency, which sold her to the couple, both doctors. The girl was paid nothing. She said the couple barely fed her and beat her if her work did not meet expectations. She said they used closed-circuit cameras to make certain she did not take extra food. In India, reported to have more child laborers than any other country in the world, child labor and trafficking are often considered symptoms of poverty: desperately poor families sell their children for work, and some end up as prostitutes or manual laborers. But the case last week of the 13-year-old maid is a reminder that the exploitation of children is also a symptom of India’s rising wealth, as the country’s growing middle class has created a surging demand for domestic workers, jobs often filled by children. The Indian news media, usually a bullhorn for middle-class interests, ran outraged front-page articles. But the case was hardly unique. Last week, an 11-year-old Nepalese girl, working as a servant, said that her employer had beaten her with a rolling pin, according to the police. Indian law offers limited safeguards and limited enforcement to protect such children, and public attitudes are usually permissive in a society where even in the lowest rungs of the middle class, families often have at least one live-in servant. The International Labor Organization has found that India has 12.6 million laborers between the ages of 5 and 14, with roughly 20 percent working as domestic help. Other groups place the figure at 45 million or higher. Unicef has said India has more child laborers than any other country in the world. Many of these children come from India’s poorest states, either through shadowy job placement agencies or by kidnapping. In 2011, more than 32,000 children were reported missing in India, according to government crime statistics. The girl’s employers, identified by the police as Dr. Sanjay Verma and Dr. Sumita Verma, were arrested Wednesday after their return to India and remanded to police custody. The police have filed preliminary charges of violations of the Juvenile Justice Act, the Child Labor Prohibition and Regulation Act and other violations of the criminal code. Their lawyer denied the charges at a bail hearing. But Mr. Kant, the lawyer with Shakti Vahini, said the courts rarely issued harsh judgments in cases involving the rights of domestic help. Around 20 million children in Pakistan, including an estimated 7.3 million of primary school age, are not in school, said a statement issued by United Nations International Children’s Emergency Fund (UNICEF) on Friday. “Investing in children and their education is vital due to the positive impacts it has on so many socio-economic dimensions. It is therefore imperative that all children in Pakistan, both boys and girls, have the opportunity to attend and complete their schooling,” the statement said. “The disparities in educational opportunities are influenced by multiple factors, like wealth, gender, ethnicity, geographic location, early learning opportunities, access and quality of learning – and it is therefore critical that all who can positively influence children’s learning opportunities should come forward to ensure that this school-year is more successful than ever,” said UNICEF Pakistan Representative Dan Rohrmann. The right of a child to receive education is enshrined in the UN Convention on the Rights of the Child. The 18th Amendment of the Constitution of Pakistan provides an added opportunity to realise this right, as Article 25A requires the state to provide free and compulsory education to all children between the ages of five and 16, as determined by the law. Taking turns to lug a heavy can of edible oil, Mushtari and Sheema Gul, twin sisters aged nine, trip home happily from their school in Ghareebabad village in Pakistan’s troubled Bajaur Agency. “Our kitchen is run on this oil,” explains Sheema. The shiny cans are distributed in her school under World Food Programme (WFP)’s ‘Back to school, stay in school’ project launched as people began streaming back to the Bajaur after the Pakistan army completed flushing out Taliban militants from the agency in April 2011. “Last year, as people displaced by the fighting began returning, we entered into an agreement with the WFP to launch the project,” Akramullah Shah, an official of Bajaur Agency’s education department, tells IPS. From 2007 to 2009, when the Taliban held sway over Bajaur Agency, about 100,000 people fled for safety to makeshift camps. “During that period Taliban militants destroyed 107 schools and disrupted education services, affecting about 80,000 students,” Shah said. With much of Bajaur’s infrastructure reduced to rubble and the mainstay of agriculture ruined, the returning residents had little to look forward to and were reluctant to take on the added burden of sending their children to school. Ghufran Gul, father of Mushtari and Sheema, said he would not have been able to send his daughters to school but for the WFP programme of distributing edible oil and fortified biscuits. “The oil is tasty and people like to use it for making rotis (unleavened bread),” he said. “We are happy. We sisters get the biscuits while the oil is used by the entire family,” said the Gul twins who study in grade three of the government girls’ high school in Bajaur. “As soon as the Pakistan army had defeated the militants, we started reconstruction of damaged schools and launched programmes to encourage the students to return, ” Bajaur Agency lawmaker Akhunzada Muhammad Chittan told IPS. According to Chittan, enrolment at the government-run primary schools had increased from 102,922 in 2010 to 1,320,876 by the end of June this year and was to improve further. “Apart from providing free books and food items, relief organisations other than the WFP have been pitching in with purchased uniforms, shoes and teaching kits that are powerful incentives for parents to send their children to schools,” he said. According to the 2008 census the literacy rate among the FATA’s 3.2 million population is just 22 percent, well below the national average of 56 percent. A brief setback to the food distribution programme occurred in December 2010 when a female suicide bomber blew herself up at a WFP centre in the Bajaur, killing 45 people and injuring 80 others. WFP spokesperson Amjad Jamal said the food assistance programme was due to run until the end of this year, but the U.N. agency has proposed that it should be allowed to continue until 2015. “The main objectives of the programme are to protect children from hunger and motivate the parents to send their children back to schools to resume their education,” he said. Except for the North Waziristan Agency, the WFP programme now covers the whole of the FATA and parts of Balochistan and Khyber Pakhthunkwa provinces. ...According to the reports, Pneumonia kills an estimated 1.5 million children under the age of five years every year over the world – more than AIDS, malaria and tuberculosis combined. “Here in Pakistan the lack of awareness among masses has been furthering the rise of chronic diseases, which is alarming,’ he added. But, he adds, luckily expensive pneumonia control vaccinations are being provided free of cost at EPIcenters in the country, as the government of Pakistan is introducing pneumococcal vaccine in the EPI programme with the help of Global Alliance for Vaccines and Immunization (GAVI). Moreover, Dr. Tariq Bhutta added that reducing child mortality rate is one of the eight MDGs, which are the world’s time bound targets for reducing poverty in its various dimensions by 2015. Pakistan is heading towards achieving that targets, while the MDG on child mortality will require urgent action to control childhood deaths by pneumonia, which is 19 percent of the all the deaths of under-five children in the country. Dr. Bhutta said that Pneumonia kills more children than any other illness – more than Aids, Malaria and Measles combined. ‘Yet, little attention is paid to this disease. After free availability of pneumonia vaccine at all government hospitals public awareness regarding the availability of vaccine needs to be increased for the EPI program to have its full time impact. It is worth adding that Pneumonia is a severe form of acute lower respiratory infection that specifically affects the lungs. ‘Chest X-rays and laboratory tests are done to confirm the extent and location of the Pneumonia infection and its cause,’ he said, adding that but here in Pakistan suspected cases of pneumonia are diagnosed by their clinical symptoms due to non-availability of latest technologies. This becomes severe when transformed to other organs through the bloodstream causing meningitis, bacterimia and sepsis. Dr Bhutta further said that during or shortly after birth babies are at higher risk of developing pneumonia. The statistics of World Health Organization (WHO) show that more than 150 million episodes of pneumonia occur every year among children under five in developing countries, accounting for more than 90 per cent of all new cases worldwide. Between 11 million and 20 million children with pneumonia will require hospitalization, and almost 1.8 million will die from the disease. But, he adds, luckily Pakistan is fortunate in the sense that pneumonia prevention vaccine has been provided free of cost by GAVI Alliance, a global NGO, to vaccinate all 5 million babies that are born every year in Pakistan. ‘A course of three injections to newborns was previously costing approximately Rs 14000, but with the funding of GAVI this treatment is available free of cost across the country for the masses. Three vaccines include the measles, Hib and pneumococcal conjugate vaccines have the potential to significantly reduce child deaths from pneumonia,’ he added. It is to be noted that immunizations help reduce childhood deaths from pneumonia in two ways: first, vaccinations help prevent children from developing infections that directly cause pneumonia such as Haemophilus influenzae type b (Hib); secondly, immunizations may prevent infections that can lead to pneumonia as a complication (e.g., measles and pertussis). Dr Tariq Bhutta encouraged all parents to take their infants at 6, 10 and 14 weeks of ages to the government EPI center and hospitals in their vicinity for vaccination.